Happy New Year! My round up of 2012 will come later in the month when Taylor Takes a Taste celebrates its 3rd birthday. Today, I wanted to bring you something that is perfect any time of day or year. 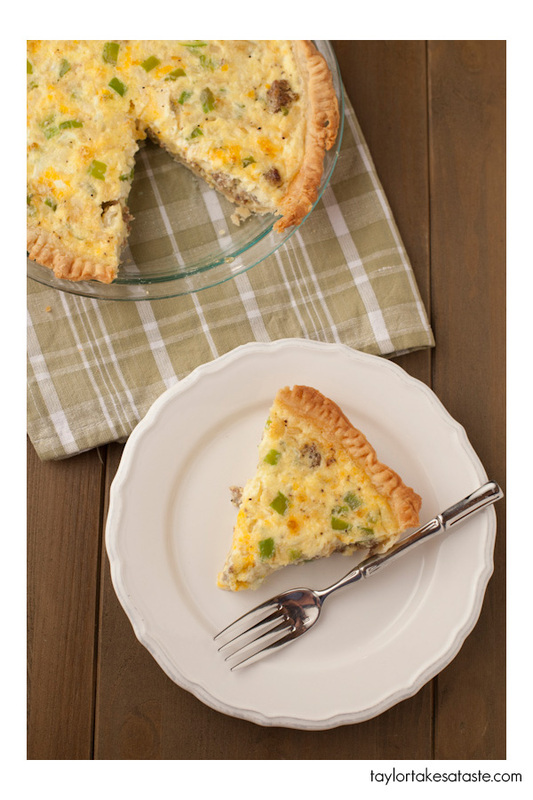 Let me introduce you to this Spicy Sausage Breakfast Quiche. This cheesy and delicate Quiche sits upon a delicious buttery crust. It can easily be made the night before and re heated mid-morning for brunch. The dough will make enough for two quiches, so feel free to make an additional one. Try thisfor your New Year’s Day brunch, or any time of day! Are you a fan of brinner? ( Breakfast for dinner) This Quiche is great for that! I am sure there will come a time in 2013 when you are looking for a new recipe to serve friends and family. Keep this recipe in mind. Come football season, it is a perfect item to bring to a tailgate! Have a great New Year’s Day! and good luck to your team if they are playing in a Bowl game. Sorry Stanford fans, I can’t wish your team luck. ON WISCONSIN!! Preheat oven to 350°F. Put cooked sausage in bottom of prepared pie shell. Cover sausage with the Pepper Jack and Colby Jack cheeses. Set aside. Melt butter in medium sauté pan. Add onions and peppers and cook over medium heat for about 5 minutes until onions soften. Remove from heat. In a medium bowl, combine eggs, cream, milk, salt and pepper. Mix well. Add mixture to the pan of onions and peppers. Stir to combine. Pour egg/onion mixture over cheese/sausage mixture in pie pan. Bake quiche for 20 to 25 minutes or until center of pie is just set. Remove from oven, cool for 15 minutes and serve or cool completely and serve at room temperature. In work bowl of food processor, place flour, butter and salt. Pulse until flour and butter are incorporated and the dough resembles coarse meal. Add milk and 2 tablespoons of ice water. Pulse. Add more ice water as needed until a dough forms. Remove pie dough from processor and divide and form two rounds. Wrap in plastic wrap and refrigerate for at least 1 hour. When ready to bake, preheat oven to 400°F. Remove one round of dough from refrigerator and roll out. Lay into a greased pie dish and prick with the tines of a fork to prevent crust puffing up while baking. Bake for about 15 minutes, or until crust is a light golden brown. Let cool before adding quiche ingredients. Love a good quiche. The pepper jack cheese is a good idea. Thanks for sharing and happy new year! Yay! I adore crusts with all butter! I also like the idea of using 2 kinds of cheese. You’ve made me think about making savoury tarts… mmm, happy new year!